The historic city of Bergen was medieval Norway's capital, and is today an international tourist centre and gateway to the famously beautiful fjords. It has a spectacular setting on a sheltered harbour of the North Sea. Situated among seven hills that form a delightful backdrop along the waterfront, Bergen is one of Norway's most enjoyable cities. 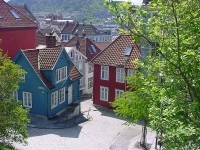 Bergen's history is closely linked to the sea. It became a major trading port of the medieval merchants of the Hanseatic League, who dominated European trade during the Middle Ages. The hub of the city's social life is around the Torget, the picturesque harbour-side market plaza surrounded by an assortment of cafes, restaurants, and pubs, and home to the vibrant fish market. Flanking one side of the harbour is a colourful row of old wooden houses, part of the historic wharf area and the remaining legacy of the Hanseatics, from where narrow cobbled streets wind their way up between the quaint houses of the picturesque old neighbourhood. The city centre is divided into two parts: the old Hanseatic town along the wharf and the modern centre stretching inland from the harbour. Bergen has a pleasant, slow pace and a cultured atmosphere with numerous interesting museums, galleries, an aquarium, and surviving medieval buildings. A cable car and a funicular carry visitors to the top of two of Bergen's hills, Mount Ulriken and Mount Floyen, to enjoy splendid views over the city and coast. Mount Floyen is covered in forest with a well-marked series of walking trails. Boat trips to the fjords are very popular and many cruises depart from Bergen's port into the gorgeous waterways that network the region.